Flip Diaper Covers Buy 2 Get 1 FREE! Happy Earth Week! Fuzzi Bunz 10% off! 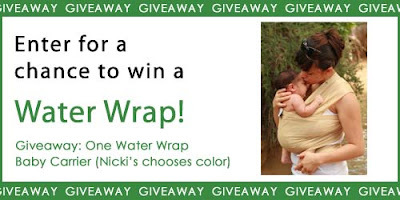 Water Wrap Baby Carrier Giveaway! Aden & Anais Crib Sheet Giveaway Winner! 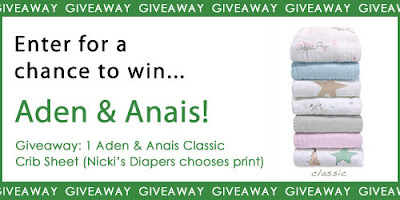 Aden & Anais Crib Sheet Review and Giveaway! Summer Prize Package Facebook Giveaway! Oh Katy Buy 5 Get 1 FREE! Planet Wise Snack Bag SALE! FREE shipping on ALL diaper covers at Nicki's Diapers! All orders over $75 ship for free, and get a free gift with all orders over $100! Hook and Loop diapers have adapted a 'bad rap' in the industry. Many Rumaprooz customers have never even tried the Aplix style, they have only used the snap version. Have YOU tried the Aplix style? Many of our customers do not know that we worked directly with Aplix at the headquarters in France, for 18 month, to engineer our exclusive quality of Aplix. Did YOU know that? Many cloth diapers sold now a days to not actually use Aplix brand hook and loop. Rather, the name 'aplix' has become a term for 'hook and loop' rather then a direct reference to the quality of 'Aplix' brand name products being used in the manufacturing of the diaper. The Aplix that Kanga Care uses in the Rumparooz One Size Cloth Diaper and been specifically engineered to our specifications. Kanga Care brand Aplix will withstand hundreds upon hundreds of hot washes and runs through the drier and the HOOK material will never relax nor lose its grip, the LOOP material will never fuzz and fray up into a useless pile of 'diaper rats nest'. The Rumparooz laundry tabs will never come lose in the wash when secured properly, thus rarely leaving the customer with fuzz to pick out of the hook material. Rumparooz Aplix diapers are virtually maintenance free and will never fail to be fastened to a baby securely. FREE shipping on all pocket diaper and all orders over $75 (in the continental US)! Aden & Anais- Mum & Bub Skin Care, perfect for the whole family! Aden & Anais are well known for their 100% cotton and bamboo swaddle blankets, and they've recently made waves with their amazing crib sheets. 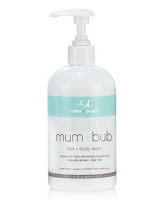 They continue their tradition of excellence with their newest line, the Mum & Bub Skin Care Collection! My family has very sensitive skin, so I was hesitant to introduce new skin products to them, but after reading about the ingredients and how they were formulated, I decided to give them a try! 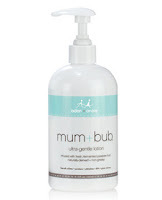 With the help of a Ellen Gendler, M.D., a leading New York City dermatologist, the Mum & Bub Skin Care Collection was created with fresh, fermented pawpaw fruit, which is known to relieve, cleanse and protect skin. It is also free of phytoestrogen, parabens, added hormone disrupters, petroleum oils, phthalates, dioxanes from sulfates, gluten, soy, petrochemicals, DEA and artificial hormones. The first thing I tried was the Soothing Ointment. I immediately fell in love with the delicious light vanilla scent of this ointment. I struggle with eczema on my hands, so I put a little of this ointment on my bad spots. I love that it's not greasy and just the right consistency, not to thick or thin. It calmed my cracking skin and kept the spots well moisturized for hours! I also used it on Emmett's diaper area and it kept him nice and clear! My almost 3 year old had a horrible cold with runny nose that made his upper lip so cracked and chapped. He is a BEAR to try to get any sort of cream on, but happily let me put this on after I let him smell it. He even ASKED for "the medicine that smells like birthday cake" for his lip several times! 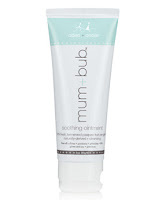 This truly is an all-purpose ointment, and I can't wait to find more uses for it! After baths, we applied the Ultra-Gentle Lotion to all of them, and I applied a liberal amount to my hands. It spread nice and smoothly and absorbed into their skin fairly quickly, leaving their skin silky soft! When my hands are really cracked like they are now, lotion often burns, but not this stuff! I love how my hands felt restored and smelled like sandlewood. There is nothing I'd like more to do that simplify the amount of products we use! With the Aden & Anais- Mum & Bub Skin Care Collection, we can do just that! No need for different products for everyone. These would be great products for any family with sensitive skin, or who are concerned about the ingredients in the products they use. They would also be great gifts for new moms! You can get you own here! If you follow Nicki's Diapers on facebook, it's no secret that I am a huge fan of Aden & Anais blankets. The only person in my family that is a bigger fan of them is 4 month old Emmett! He LOVES being swaddled in the muslin wraps, both cotton and bamboo. When he's awake, there's no place he'd rather be than with his face snuggled against one, whether that's on my shoulder or tucked into a carrier. After first discovering how much Emmett loved having his cheeks on an Aden & Anais blanket, I had thought about laying him down to sleep on one in his crib, but having a loose blanket in there at such a young age still makes me nervous, then I heard Aden & Anais was releasing a crib sheet and I could not have been more excited! After receiving the Aden & Anais crib sheet, I was even more impressed! 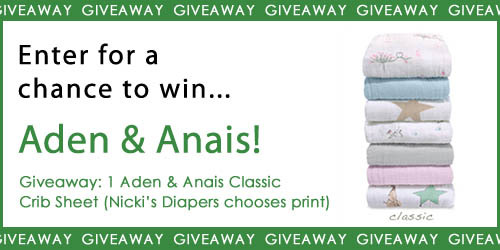 Aden & Anais products are always top quality and this sheet continues with that long-standing tradition. It washes up beautifully and soft and fits nice and snug on Emmett's crib mattress. It's been washed several times now and just like the blankets, it gets softer and softer with each wash. It's breathable, so my usually roasting baby wakes up without sweaty head :) This sheet is unique in that it keeps baby warm in the winter and cool in the summer. 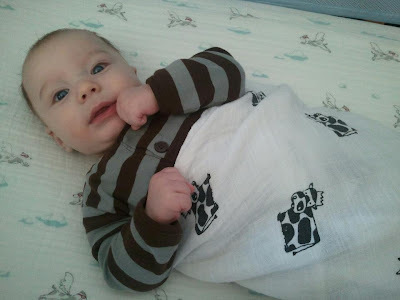 No need to buy different crib sheets for different seasons, this one is perfect year round! If you love the idea of having an organic crib mattress, but don't love the price tag, the next best thing would be an organic crib sheet! The Aden & Anais 100% Organic Cotton Crib sheets are made from certified organic cotton that is grown in an environmentally and socially responsible manner so you can feel good about putting your baby on it each night! Whether you chose the Classic Crib sheets or the Organic Crib Sheets, there is a print or solid color to match every nursery! Emmett's crib has the Liam the Brave Flying Dogs that perfectly match his primary color nursery. In the ever growing baby industry, there are a lot of products out there, but this one is worth every.single.penny. 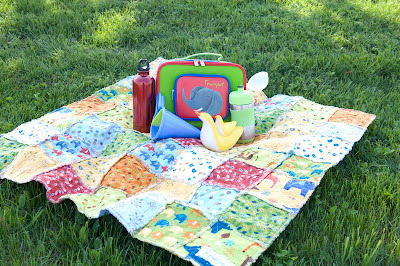 It would also make a great shower gift for one lucky baby! 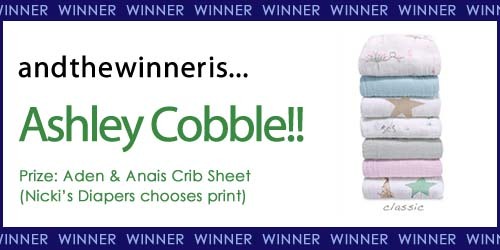 You can now get your own Aden & Anais Crib sheet for your little one! We have a full stock, but these are expected to sell quickly! Would you like to win one? Enter below! Summer is coming! Win a prize package valued at over $60, perfect for a picnic or day at the beach! Package includes toys for sand and water, stainless steel water bottles for you and your little one and an adorable lunch box! First, you must "Like" Nicki's Diapers on Facebook. Then, leave a comment on the original thread telling us your favorite summer or beach activities you and your children share! One random winner will be drawn April 17th! Good luck! This is Jack. Jack is a four-and-a-half year old boy who loves robots, Star Wars, his dog Starr, playing outside, and video games. Jack loves to run, jump, swing, climb, crash, and slide. Jack loves his little brother and his mom and dad. He is an absolute joy and his smile lights up a room. Jack also has autism. This means that Jack sometimes has trouble communicating -- he can't keep up with conversations as well as other kids, and doesn't always answer questions the right way. He sometimes has a hard time in certain environments -- loud, busy, bright, or otherwise stimulating places or times can be very difficult for him to handle. He gets easily frustrated and can't figure out how to express himself. He doesn't always respond to his name. He doesn't really understand humor or emotions. Sometimes it means that he doesn't understand the games or feelings of other kids. Jack bounces and flaps his arms when he's excited or proud, and likes to quote his favorite shows or characters. Sometimes he gets lost in his own little world. Jack is my oldest son. He was diagnosed with autism when he was a little over two years old. It didn't bring our world crashing down. It didn't change him. 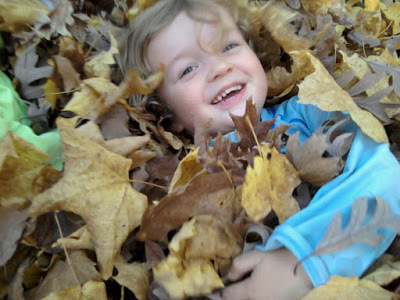 He was still the same Jack as the day before that diagnosis came -- his diagnosis was a relief and a starting point. It meant that we could help Jack grow and learn to be the best Jack he could be. But it didn't come easy after that -- we had to fight for his services, his therapy, his help. It shouldn't be like that. Autism is diagnosed in roughly 1 out of every 167 children, and yet funding for research and programs is far lower than for disorders and diseases facing far fewer children. That's why I support the Light It Up Blue! campaign -- to bring awareness to autism and to all the families affected by it every day. 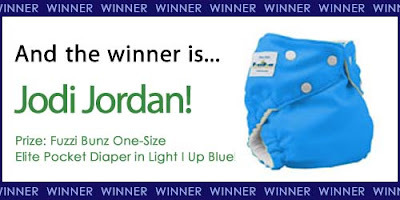 Nicki's Diapers is offering 15% OFF the Light It Up Blue! FuzziBunz One-Size Elite Pocket Diapers today, April 2nd in honor of World Autism Awareness Day. FuzziBunz generously donates $1 of every Light It Up Blue! diaper purchased to Autism Speaks. We're also giving one away -- help us raise awareness and win! For the entire month of April, take advantage of this GREAT deal on Oh Katy One-Size Pocket Diapers! For every 5 diapers you buy, get 1 FREE! 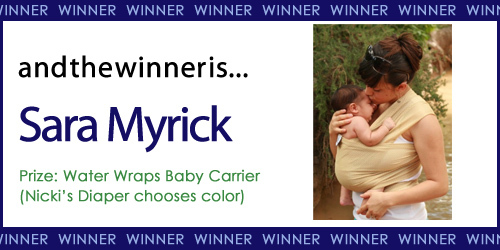 Even better... FREE shipping on ALL pocket diapers at Nicki's Diapers! Don't forget...FREE shipping on ALL pocket diapers at Nicki's Diapers! ALL Planet Wise Products are Made in the USA! Sweeten the Deal- ALL Planet Wise Products ship for FREE from Nicki's Diapers!